Camping RCN Port l'Épine är en camping i Trélévern, Côtes-d'Armor, belägen vid havet. Campingen har platser med stängsel, utan skugga och platser med lite skugga. Camping RCN Port l'Épine ligger i närheten av en stenstrand. Det finns möjlighet att hyra tält, husbilar och bungalows. På campingen finns en lekplats. Campingen förfogar över en utomhusbassäng och ett knattebad. I den närliggande omgivningen kan du också simma i havet. I Camping RCN Port l'Épine är det tillåtet att vindsurfa och åka forsränning/åka kajak/åka flotte. Denna inspektör gör varje år ett besök på Camping RCN Port l'Épine och inspekterar campingen för ca 200 faciliteter och för andra förekommande punkter. Inspektören är en medarbetare från ACSI och arbetar inte för campingen. Well appointed site with superb aspect/views. Poor arrangements for arrivals over the midday close down. This means that they leave a map of unbooked emplacements-unfortunately if first arrival takes map others are in the dark. We wasted three hours getting set up as result and were not treated sympathetically by management. All other staff young friendly and helpful. We chose the site after researching the desired area, the description offered a lot to live upto! Being British, and not speaking another language I found the booking experience to be very simple...my questions about the facility were answered promptly and accurately, which gave me confidence. The site was not a disappointment at all....very helpful staff, who all spoke perfect English. Nothing was too much trouble, the maintenance man also lent me a multi-meter when I had a problem in my touring caravan. The facilities on site were brand new...opened the day we were there and were cleaned spotless! The most amazing thing was the wi-fi...I was at a remote pitch, and received good signal.....great! This is a very relaxed, quiet site, with direct access onto a pebbly beach with part sand....a national coastal footpath skirts the site (the GR34) and its so easy to walk to many other places. A nice village offers some useful shops and a couple of cafe\'s. Used in the main by Dutch (naturally thats who they target market) so being a \'Brit\' was a bit of a novelty (which was nice) we made lots of good acquaintances whilst on site. All essential services work well and are clean and fully serviceable. Some lovely places to visit in the immediate vicinity. I fully recommend this site! Vill du boka campingen Camping RCN Port l'Épine eller få mera information? Det går bra med nedanstående uppgifter eller via campingens webbsida. 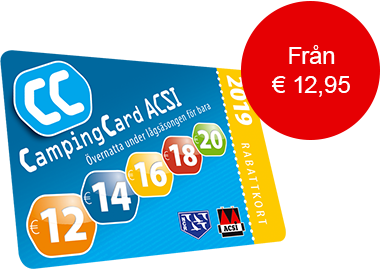 ACSI Eurocampings skickar din informationsförfrågan till "Camping RCN Port l'Épine".